Our "obscure site" for the week is the Roman city of Mitylene, a city that Paul visited during his third missionary journey. 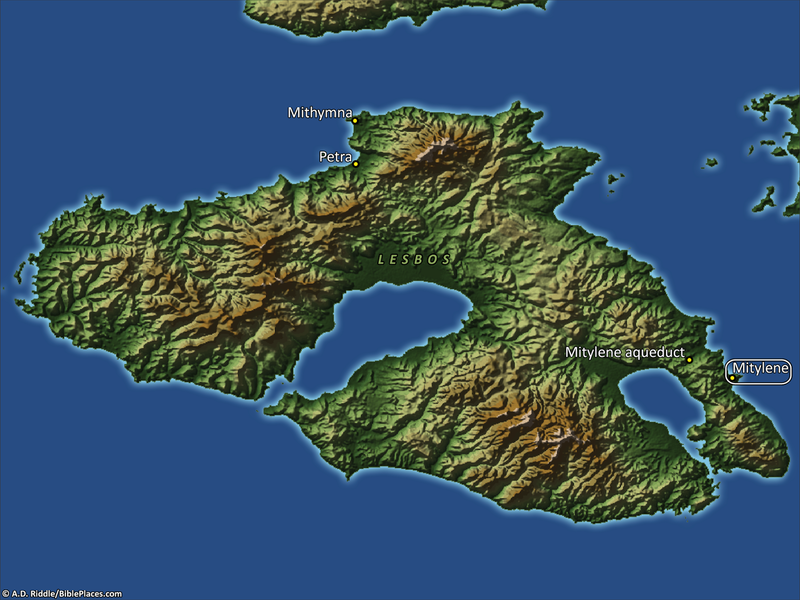 (Click on the map above to see its location on an island off the coast of modern Turkey.) If you don't remember reading about this city in the New Testament, don't feel too bad. It is only mentioned in passing and Paul spent less than a day there while he was traveling back to Jerusalem. Perhaps the best way to remember it is to tie it to the story of Eutychus. So only a few days after raising Eutychus, we find Paul in Mitylene. This passage makes clear that Paul was quickly moving through this territory and it is not even clear that he set foot on the island of Lesbos where this city is located. Consequently, the city finds itself on our list of "obscure sites in the Pictorial Library of the Holy Land" instead of prominently displayed on the BiblePlaces website along with Samos, Miletus, and Ephesus. 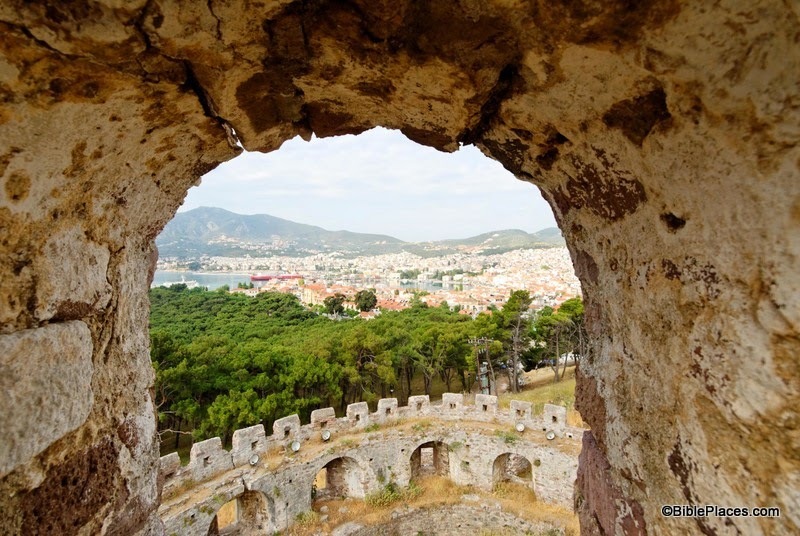 In the image above, you can see the modern city of Mitylene through the window of a medieval castle that sits on the city's peninsula. This peninsula is actually man-made, similar to the one at Tyre. The castle sits on what was once an island that stood a short distance from the shore. At some point in the city's history, a causeway was constructed from the shore to the island, and subsequently two harbors were formed (one of which probably sheltered Paul's ship during the night he was there). The ancient city was inhabited from about 1200 B.C. until A.D. 151 when it was destroyed by an earthquake. In addition to the apostle Paul, the city also played host to Aristotle and Epicurus during its long history. Now, you probably did not get up this morning and expect to read a blog post about the obscure city of Mitylene or the biblical story of Paul and Eutychus, but this post illustrates an interesting phenomenon ... We are curious creatures and images have a way of drawing us into a story. They lead us to want to know more. If you are a teacher, a preacher, a professional in the corporate world ... someone who stands up in front of people and delivers information verbally ... you should take note of this and use it to your advantage. We live in a visual culture. We also live in a generation that has resources which previous generations could only dream of, if they could imagine them at all. We have at our fingertips photographs and illustrations of places and things all over the world! So the next time you stand up to talk about obscure (or not-so-obscure) topics, start with a photograph. Draw your listeners in by using an image as a springboard to your discussion. Equip yourself with collections such as the Pictorial Library of Bible Lands, Historic Views of the Holy Land, or something similar that exists in your field of expertise. Then use people's natural curiosity to lead them where you want them to go. Once you have their attention, you can take them anywhere. This photo is available in Volume 12 of the Pictorial Library of Bible Lands and is available here for $24 (with free shipping). This volume focuses on the Greek Islands, and includes the islands of Samothrace, Samos, Patmos, Cos, Rhodes, and others.